My introduction to Pakistani-British writer Aamer Hussein was oddly serendipitous. It came through an unsolicited essay submitted to me for possible publication at 3:AM Magazine. I had no sooner read the piece through before I ordered a copy of one of the short story collections mentioned. Then I wrote a letter of acceptance. Although Hussein has more recently explored the longer novella form and has even begun to write in his mother tongue, Urdu, his short fiction is especially impressive and seemed like a good placed to begin my acquaintance. Published in 2007, his fourth collection, Insomnia, is comprised of seven stories that feature a variety of Pakistani-born narrators or protagonists negotiating new or changing environments—travelling in Europe as Islamophobia is on the rise, adapting to life in London as a teenager, balancing political idealism fed abroad with a longing to return home, or slowly building a writing career against the backdrop of the Second World War, Indian Independence and Partition. A sense of displacement is common, as is a quiet, aching nostalgia for something that is missed but cannot quite be clearly defined. The longest story in the book, “The Crane Girl,” is set in London of the 1970s. Murad has, like the author, arrived from Karachi at the age of fifteen to complete his schooling. He becomes infatuated with Tsuru, a mercurial Japanese girl several years his senior. With her he learns to smoke and listens to the music of the day—James Taylor, Carole King, Cat Stevens. But then, without warning, she disappears. Murad is at a loss, awkwardly trying to socialize with Tsuru’s former flatmates, a Canadian boy and an Australian girl, until he meets another Japanese youth, Shigeo. Seemingly self-assured, his new friend turns out to be a moody, manipulative boy with a penchant for Spanish guitar and an uncertain attraction to Murad. Murad didn’t like asserting his views and tastes the way Shigeo did. (Recently, when the trouble had begun between the east and west wings of Pakistan, Shigeo had asked him about the situation as if he wanted to pick a fight, and Murad had uncharacteristically retaliated by bringing up Japan’s treatment of Korea. But that was a long time ago, Shigeo said, Japan had learned its lesson.) What, after all, did they really have in common, apart from their loneliness? Being foreign boys in London? Their dark hair and eyes? It wasn’t as if Murad was planning to drop Shigeo: he’d just avoid him for a while. Their friendship had become too much like a habit. And then, of course, Tsuru returns, as suddenly as she had disappeared, and the situation becomes more complicated. Again, just like adolescence. The political and the personal overlap in the haunting “Hibiscus Days” in which the narrator, dedicated to translating the final poems and fables of his friend, Armaan, finds himself lost to memories, mysteries and regrets. The story retraces the relationship between four friends, two couples, all from Pakistan, who meet when they are studying in England. When Armaan and Aliza decide to return to Karachi and get married, they appear to be opting for more conventional middle class lives while the narrator and his girlfriend who stay in London become more committed to a political idealism. The complexities of exercising one’s politics at home and abroad are ultimately thrown into harsh relief, in this sad and beautiful tale. Finally, another outstanding story, perhaps my favourite, is “The Angelic Disposition.” Set primarily in Delhi, this is a female writer and artist’s account of her life and career, directed to her friend and mentor, Rafi Durrani, an established writer with whom she had a writerly relationship primarily conducted through letters. Rafi was of medium height and medium colouring, and he seemed surprisingly weightless. In his world darkness seemed not to exist. And yet I could recognise compassion in him, too: his wasn’t the wit of callousness or disdain. He wasn’t a Marxist; neither was I. But to sing so blithely about love in a time before siege? Those were strange days. We—the scholarly, the teachers and doctors and lawyers—were trying to find a place in a world that we were increasingly aware was no longer our own; and we felt obliged to write about change, to write to change it all. Rafi encourages her to write for children, sometimes adding illustrations to her work. Theirs becomes a friendship born of mutual respect. It’s not romantic, they each are married to others, but his willingness to listen to her and share stories about his own life is critical to the support of her career, which is, at the time, quite unconventional for a woman. In any exchange of letters there’s a writer and a reader: this is invariable. It’s hard to explain. I have something to say, to impart, to confess. You listen. And sometimes you, too, start singing, your triumphs, your failures and your little tribulations. But you could be saying all this to anyone. You’re writing to make me write, that’s all. After his early death, fighting for Britain in the Second World War, she continues to address Rafi, as an angelic presence and inspiration. He may be her hero, but her gift and passion for art and literature are her own and will see her through the difficult years of the twentieth century. The true strength of this beautifully crafted tale, lies in the quietly dignified and powerful narrator whose presence lingers long after the story comes to a close. This is an extremely satisfying collection and I am certain that my first experience of the work of Aamer Hussein will not be my last. And, in case you’re interested, the essay that sparked my interest, “Silence as Resistance in Aamer Hussein’s Stories” by Ali Raz, can be found here. 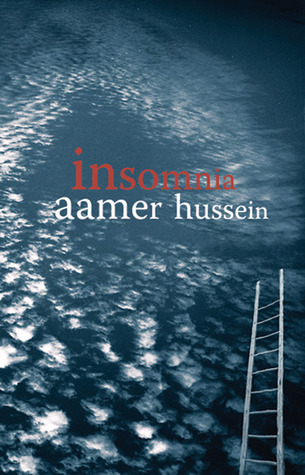 Insomnia by Aamer Hussein is published by Telegram.